Cats and dogs over ten years of age make up just over one third of the UK’s pet population but over half of all visits to the London Veterinary Clinic are with older pets. On these pages we’ll discuss the normal signs and symptoms of old age and what we can to do make our pets lives as comfortable and as interesting as possible. Aging brings medical problems and there’s a simple reason. Every cell in your pet’s body has a biological clock built into it that determines how long that cell will live. Some cells, for example those that line the inside of the intestines live for less than a week and are constantly and efficiently being replaced by brand new cells. With advancing age, this ability to create new cells eventually falters. New cell production is not as fast, or as accurate or as efficient as it once was. With those intestinal cells, for example, this inefficiency may lead to less efficient absorption of nourishment and consequent weight loss, or poorly movement in the bowels leading to constipation. Other cells, for example brain cells, don’t have the ability to replace themselves. A pet acquires its maximum allocation when its young and then it’s up to its body to hold on to them as long as possible. As these cells die they aren’t replaced. Both inefficient replacement and no replacement create many of the medical conditions associated with aging. For example, previously ‘clean’ pets may loose their toilet training. Sometimes there’s a physical cause such as sphincter muscle weakening that leads to urinary or bowel incontinence, but in other instances keeping the den clean ceases to be of great importance because the brain cells are no longer overseeing body functions as they once did. An individual may urinate or defecate inside the house or outside the litter tray because it’s no longer a priority to ask to go out, or to use the tray. 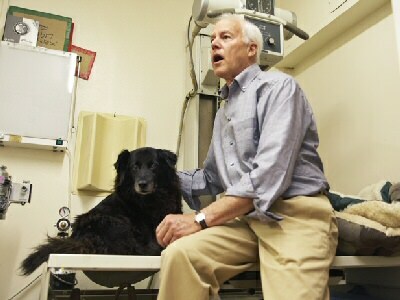 These normal brain changes occur faster in some pets than in others. Just as with us, senile behaviour changes vary considerably from one pet to another.